CAL stands for crochet-a-long, a crochet project where lots of people join in and do it at the same time. There are always CALS going on somewhere, this year there is a worldwide mood blanket CAL, but I am not part of it. However, I am participating in 3 CALS at the moment. One is the Kaleidoscope crochet blanket, which I am blogging about monthly each time I complete something. Then there is my own CAL – The Hexagon Project 2014, which I blog about also from time to time. And the third is one I joined only recently. 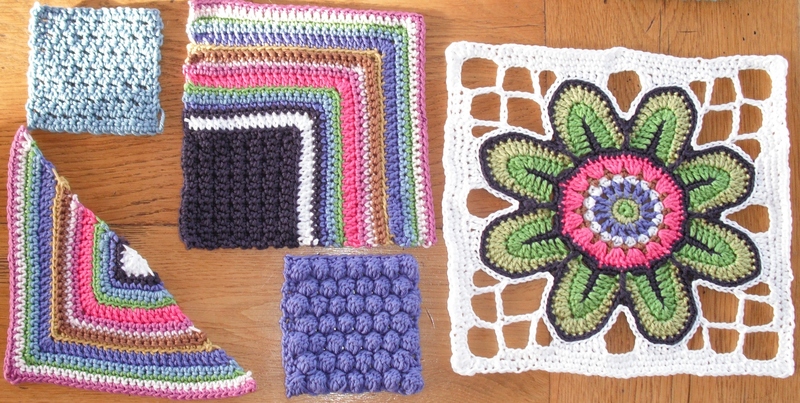 I hinted about it in my last blog post – it is the Jane Crowfoot Mystery Crochet Blanket CAL. Yes, another blanket! I joined it on a whim, just as I had finished the February instalment of the Kaleidoscope CAL. I must be mad, as I have more than enough projects to keep me going as well as lots of ideas for designs in my head. But I love joining in CALs and I knew one of my friends was in the Jane Crowfoot club, so I just did it! I’m sorry about the quality of the photo, I had such a problem today because the sun kept getting into all the shots. But that is a welcome problem! This is the completed February instalment, or at least half – there are 2 of every motif. And the good thing is the March instalment comes out a few days into March, hopefully just as I finish the March instalment of Kaleidoscope. So the timing fits in perfectly. They are different, very different – which is good. One is in cotton yarn the other in merino wool, I find the merino (a single) much better to work with. One has beads in the design. One is join as you go, the other is join at the end – I prefer join as you go, and I am dreading the chore of joining at the end! There is one other point, not a comparison of the projects but of the approach. There is activity on Ravelry for both CALs, but only one of the designers is active in this so far. I do hope the other designer pops up on Ravelry soon, because the Ravelry community is there only because of her design and she should be part of that community. I am enjoying doing both CALs, it is good to ring the changes. And it will be interesting to see how they compare at the year end. Do you join in any CALS? If so, please share your experience of them.